Happy 2015! I am so excited for the beginning of 2015 and that means prom season is officially here! Lots of our brand new dresses are arriving into our Boulevard Mall store and I am in love with every single dress. Honestly, there isn’t a single piece that I wouldn’t wear myself or recommend to someone I know. From long and simple to short and flirty, there is a dress for every type of girl. Our Boulevard Mall store is already stocked with some new arrivals while more will be coming as the weeks go on! We’ve picked up a brand new line called Clarisse that is just breath taking and perfect in every way. Take a look at some of my favorites! Don’t forget that TT New York is the only store in Buffalo that has prom tracking so we don’t double sell your dress to your prom! Xoxo. Click on the picture below to be taken right to our TT New York Prom 2015 page to see all of our new arrivals! Sweetheart Neckline: Sweetheart is the most common neckline. It is perfect for every chest size and can be paired with any skirt type. From mermaid, to a-line; the sweetheart neckline looks amazing with anything. If you are bigger chested but love the sweetheart style, try adding spaghetti straps for a little extra support. Even a one-shoulder strap can make a whole lot of difference in giving you the support you need all night long. Halter Strap: Halter straps usually go up and clasp behind your neck but sometimes can hook at your shoulders for an open back look. If you require more support in the bust then a halter strap is the best style for you! Some girls don’t like the idea of having to pull up their dress all night long but hate the idea of wearing straps, so this is a perfect happy medium! You get both the comfortable feeling and the look is always elegant and beautiful. Drop Waist/Mermaid: If you want to show off your natural hour glass shape, then mermaid and drop waist are the perfect look. Most girls think that you need to be a size 02 to look good in mermaid styles, but in reality the more curves you have, the better mermaid dresses look on you! 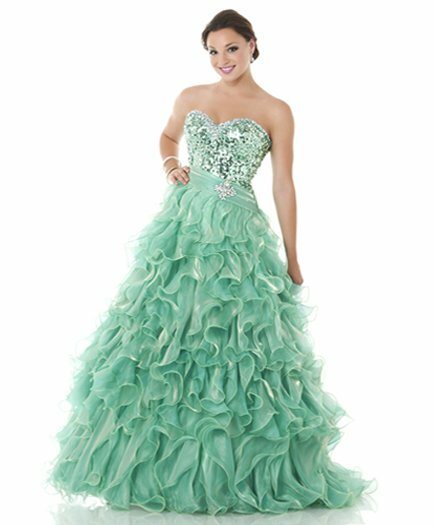 Mermaid and drop waist dresses cinch in at your waist and show off your natural figure. If you think mermaid dresses are too hard to walk in, then try the drop waist! Drop waist dresses only hit you at about the hips and flow out from there. (for example, the red dress in the middle is a drop waist, the two other dresses are mermaid) Both looks are elegant and truly define your natural curves! 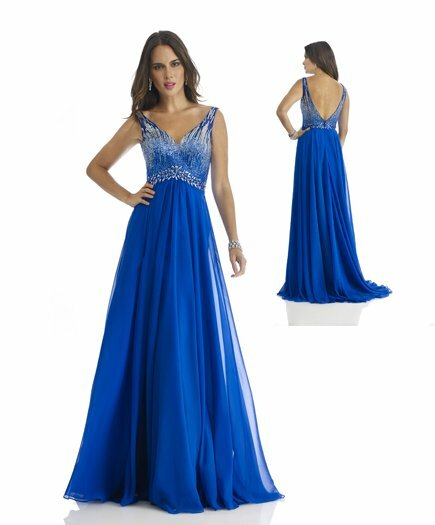 Empire Waist: If you want to find a prom dress that flows without hugging your body, then empire waist is the style you want to be looking for. Empire waist dresses are tight around the bust and can either be strapless or with straps, and they flow away from your body. Most girls feel more comfortable in the empire waist styles, because they are both flowy and comfortable. V-Neckline: The v-neckline is another very common look. For girls who once again who need some support on the top, this look will keep you comfortable while still giving you that elegant look. Most of the dresses have thicker straps so you can easily wear a bra with it for extra support. Some styles do have a deeper v-cut, but most stop right before the bust. You can also find styles that have the v-neckline with open backs too!! With proms starting to begin, I figured I would dedicate a blog to some of my all time favorite prom hair styles and makeup looks. Some girls have absolutely no idea what to do with their hair or make up and I have a very simple rule to follow, the simpler the better. If your dress is really detailed or has a lot of bead work on it, going over the top with hair and makeup will only take away from the dress. That is why if you keep the makeup to a minimal and do a more simplistic hair do, you will heighten your natural beauty without looking like you’re trying too hard! I am going to share with you some of my favorite makeup styles and hair do’s to give you an idea of some simple styles! Join me this Saturday, March 8th from 12-4pm for a fun filled shopping day at our Walden Galleria store! 2 Day FM, Niagara’s Hottest Radio Station, will be playing all of the latest songs while you shop around for that perfect dress! No matter what occasion you are shopping for, TT New York is the one stop shop! 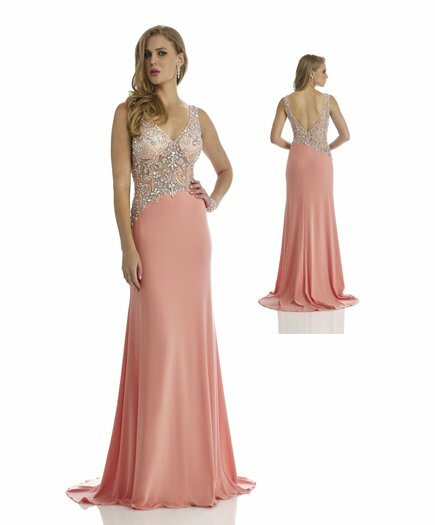 We have cocktail, evening gowns, mother of the bride/groom, bridesmaids, and of course prom! This week received a brand new shipment of short dresses that are perfect for prom or grade 8 graduation! We also got brand new jewelry and purses to match every dress in our store! Who doesn’t love walking into a store and being able to purchase everything in one stop?! 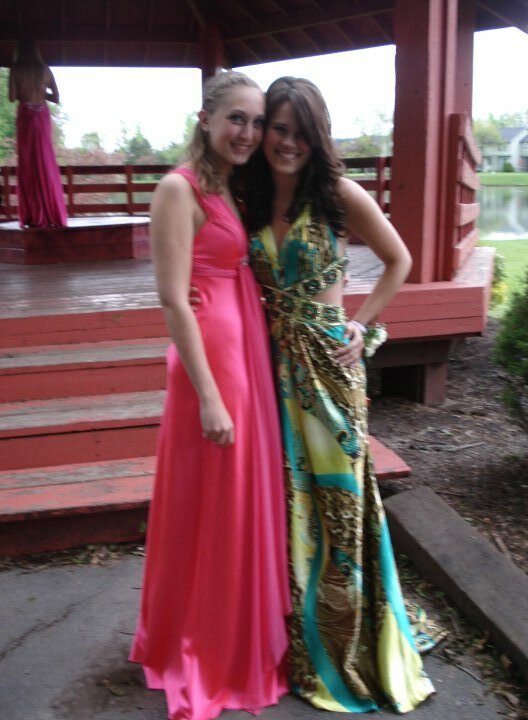 Don’t forget about our event tracking, we track every dress sold so you are the only one in your dress at your school! Tune into 2 Day FM 105.1 to hear more about our event this Saturday!! Don’t miss out!! We are located on the lower level of Walden Galleria directly across from JCPenney next to Charlotte Russe and PacSun. Follow the music to our front doors and come shop with us! I am very excited to announce that we recently opened a new location in Walden Galleria Mall!! We carry dresses there for every occasion from prom, homecoming and sweet 16’s to bridesmaids, mother of the bride/groom, black tie, and wedding dresses!! With this being the heart of our prom season, we are constantly getting in brand new shipment . The great thing about shopping with TT New York is that we are very flexible. We offer a 30 day layaway plan where you can make weekly payments on your dress! Also, you don’t have to worry about the hassle of sample sizes! We have a full size range in all of our dresses from sizes 0-28 that you can buy right off the rack! And who could forget about our event tracking? We will track your dress for any occasion you are attending from galas, proms, banquets and other events!! And lets face it, no one wants to show up to an event wearing the same dress as someone else. TT New York will make sure to not only make you look amazing on your special day, but also assure you that you will be the only one in your gown. I’ve been to the store a couple of times since we have opened and I love everything about being in that mall. It is in a prime location right across from JC Penney’s on the lower level. We are also right in front of the Verizon kiosk and in-between Charlotte Russe and PacSun! Walden Galleria is such an amazing mall with not only the best stores to shop at, but also the best restaurants. You can truly spend hours at this mall and never get bored. Not to mention the new go-cart track they have upstairs near the food court!! You get shopping, dining and entertainment all in one location! They have flat screen tv’s in front of the Microsoft store that you can play live games!! I definitely recommend visiting Walden Galleria to not only get your shopping done, but to experience a lot of different things. You will never want to shop at another mall again!! Style #1- High Ponytail: If you have long thick hair like me, then you know the pain of trying to wear a high ponytail. You need to double up on ponytail holders and have a killer headache at the end of the day when you let you hair down, well no more of that! This simple and easy trick will help make rocking a high pony that much easier and make your hair look longer! Split your hair into two sections, one for the top half of your hair and one for the bottom. The top ponytail will cover up the lower ponytail and you will now have a long, sleek ponytail without the headache! Style #2- Top Knot Sock Bun: Every woman loves to wear the messy bun when they are being lazy or have a bad hair day, but messy buns aren’t always appropriate. If you are having a bad hair day but need to do something with your hair for either work or going out, try these easy to follow steps to master the sock bun! You can take the access hair and either twist or braid it around the bun to add an extra touch! Style #3- Braids Overnight to Create Natural Waves: Since my hair is so unbelievably thick, I barley ever blow dry my hair when I get out of the shower. One of my favorite tricks to save me the hassle of styling my hair and takes no time at all is to put my hair into either pigtail braids or a single braid while still wet and sleep on it overnight. If you have thinner hair, you can do a twist instead of a braid. Put your hair into a low ponytail and then separate into two pieces of hair and twist. I will sometimes spray some scrunch spray into my hair before braiding it to help hold the curl. When you wake up in the morning, take out the braid or the curl and you have effortless beach waves! It is so much easier than using a curling iron and you don’t damage your hair from the heat either! 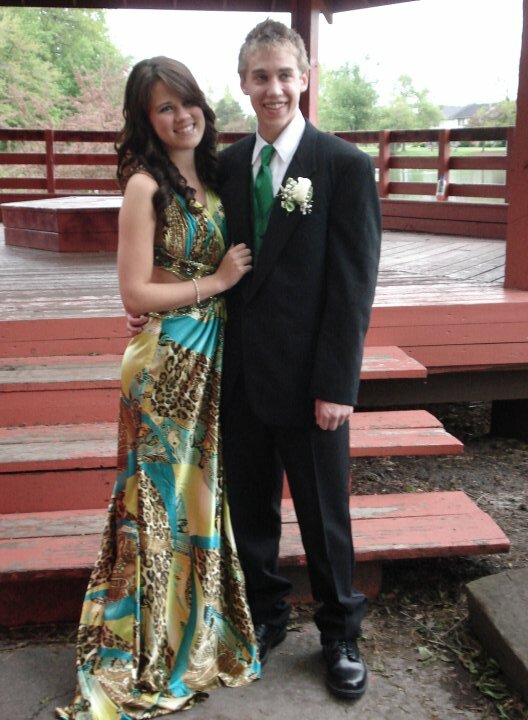 It’s that wonderful time of the year again, prom season. From February to late June, high school girls are going crazy over making sure their junior or senior prom is perfect in every single way. They will spend weeks or months making sure they have the perfect dress, the best hair do, the prettiest makeup and of course the best looking date. I guess you could say it is the second most stressful day of a young girls life, first being their wedding day. They need to make sure everything is perfect, and I have to say, it is extremely stressful to plan a night together with all your friends. Who’s house are pictures going to be done at? Are you going to rent a limo bus? Where do you go after prom? And being typical teenagers, plans are always changing from one minute to the next. Before I began working as the Marketing Assistant for TT New York, I was a sales associate at one of their locations and by far all of the staff’s favorite time of the year was prom season. I can honestly say that if I didn’t have TT New York during both my proms, I probably would have thrown a fit and decided not to go due to the stress. Shopping there made everything so simple for me, I knew what was the “it” look for the year because TT is always up to date on the latest trends, and I loved the fact no one could have the same dress as me because of the event tracking. For junior prom I bought two prom dresses, yes two. 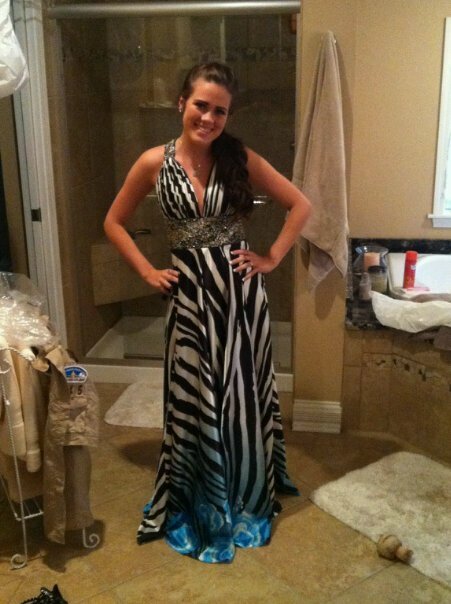 The first one was more simple and I loved it until we got a brand new shipment in with a cut out leopard printed dress in it, and it was love at first sight, so yes I bought that leopard dress the day before prom as well as all of my jewelry. But I couldn’t help myself, looking at all those gorgeous dresses week after week, I just needed that dress, and it is still hanging in my closet because it was so beautiful. Senior year I was way more prepared and made sure to buy my dress with time to spare. The fact I could purchase my dress and get it altered at right at TT New York saved me a big headache. I didn’t have to go out searching for a tailor because each store had one seamstress on site every day. I could easily match up my dress to shoes and jewelry because TT offers such a wide variety of necklaces, earrings and bracelets, it is truly a one stop shop. 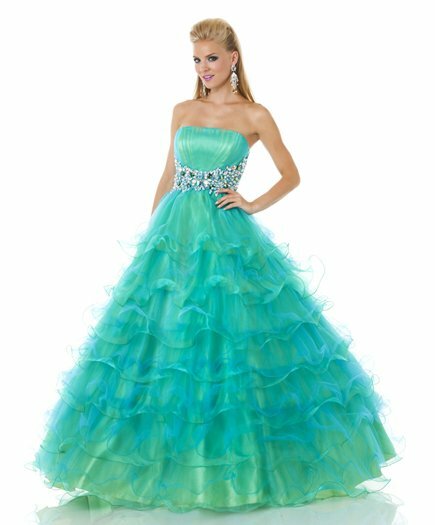 When I went to prom, most girls wore full length gowns that were patterned and beaded, but over the past few years there has been a huge demand for short prom dresses. Now we carry everything from short poofy prom dresses, to tight fitted ones with beautiful open backs. Walking into TT New York you will see new styles that you didn’t know existed. I remember when we got a shipment of high-low dresses and all I could think about was how creative and gorgeous they were, and boy did they sell out quickly. With new changes to dresses there will always be styles that remain the same. Princess ball gowns, mermaid cuts, and the popular empire waisted gown are some of the constant favorites throughout the years. Every year brings some sort of change from either the material or the design, but no matter what there will always be the perfect dress out there for every girl.